Back in the 80s there was a secret war going on. Also, the Cold War was happening which was not quite as cool as Spiderman and Wolverine high fiving on a distant moon in an alternate universe after beating up space Nazis and drinking cold beer, but it was a bit more well known of an event. Spies were everywhere, stealing secrets and hosting cooking shows. It was a pretty big deal. Confusion: Espionage and Deception in the Cold War from Stronghold Games tries to capture the feel of running a team of secret agents without the assassination and french soufflé. In the end, its a fun game without soufflé. In the box you'll find a bunch of Russian and American spies, blocks that say how they move (think of them as the spies directives), a top secret brief case, a massive game board, and two equally massive secret dossier that allows you to track the movement of your opponent. Gameplay is fairly simple, though it does take a bit of getting used to the first time round. 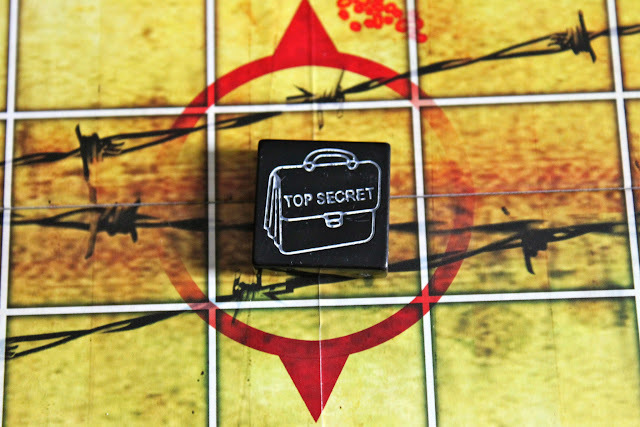 To win the game, you need to pick up the top secret brief case and get it across enemy lines (the back row on the the board closest to your opponent) without getting eliminated. Each piece has a special and unique movement that only that spy can do, except you don't know what it is. In order to move your pieces, you need to ask your opponent if the move you would like to make is legal based on the movement piece that only they can see. If they say yes, then you can move accordingly. If the say no, then you can't. Then its their turn, and so on until you have properly deduced what your pieces can do so you can win the game before your spies are killed. 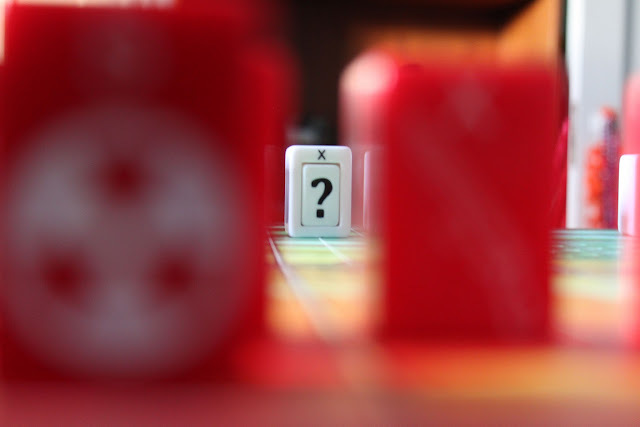 Using the dossiers, you track what you know about each of your spies, as well as what your opponent knows about theirs. What comes of this is an interesting game play where you have to stumble around in the dark for the first turn or two until you think you understand the basics of what your spies can do, and which ones can do what. Each spy can potentially be one of thirteen, each with a subtilely different movement. While you don't need to track it, it certainly helps since you have so many potential options that you need to limit down so you can grab the top secret briefcase and bust a move. However, in the middle of all this is a double agent, adding even more doubt to what you're doing. The double agent is pretty much the most brilliant piece of the entire game. Your opponent can tell you whatever they want with the double agent, and can have it turn on you in a moments notice. Just as you are about to get the case across enemy lines, the double agent suddenly stops moving and hands it over to the enemy. 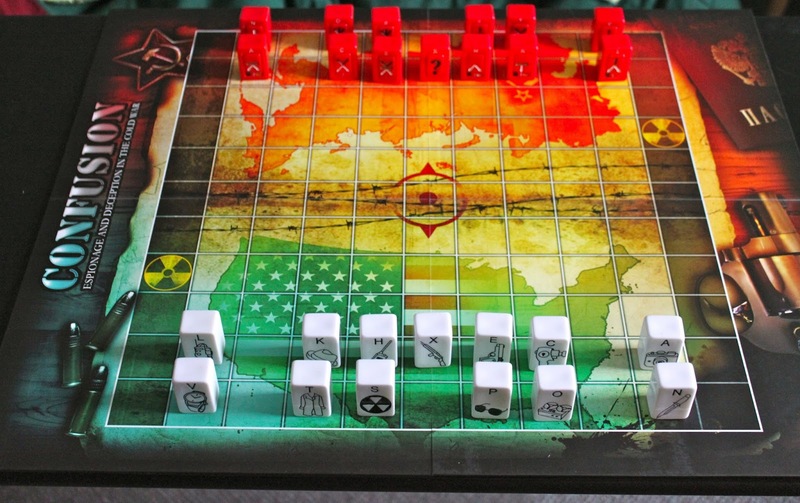 In the end, it plays like a cross between checkers and reverse stratego with an insane amount of deduction going on, but with spies. I've played a handful of games to date, each being a bit different from the last. The not knowing if you're going to win until you do is a pretty cool feeling to have, and the mystery of what you can and can not do is both frustrating and keeps you on the edge the entire time. I found some of the pieces are difficult to read in low light, specifically the white on red letters, which required me to have to either lean in close or pick up the pieces and look closely, but that doesn't take away from the quality production of the game, or how it plays. 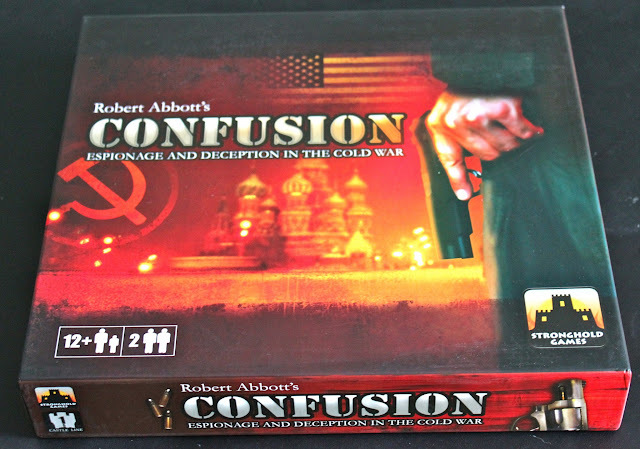 Confusion has been a great game to play with a lot of replayability in it due to the randomness of the inner pieces and where they will end up. 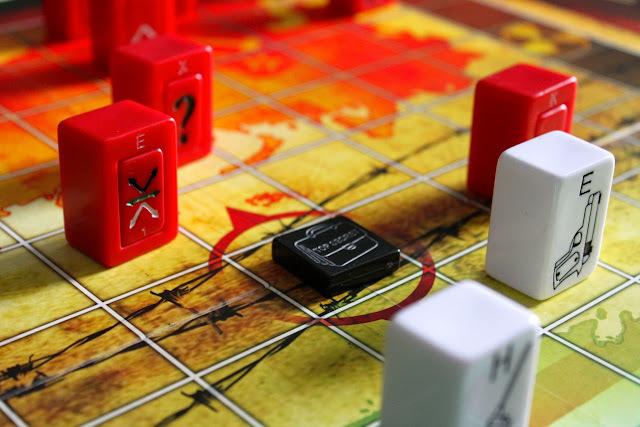 The first couple games play quick, followed by some really deep in-depth game play that will leave you questioning yourself right up until the end, in a good way.